This trendy suite is located on Main Street in Wellington. It is a self-contained 1 bedroom unit, with Queen bed, nook and ensuite bathroom on the second floor of a quaint cafe. This Suite is ideal for the couple wanting to get away from cooking and experience the culinary delights available in the County along with the wineries, art studios and the beautiful beaches. Stay in with Roku Internet Television and an evening of Netflix or hop out for a walk, cycle or run. The Flats are between Wellington's most popular: ice cream shop, plant shop, cafe, bike rental, art gallery, Drake Devonshire, Midtown Brewery, The Courage Bar, Festival Players and East and Main. Numerous wineries, breweries and beaches are just minutes away. This suite is directly above The Parlour Studio and adjacent to the East Suite which is directly above the Enid Grace cafe. It is open at 7am and offers a wide selection of freshly baked goods, full breakfasts, coffee and teas. The Flats East unit can also be rented, if available, located directly across the hall. Great location; parking spot is a plus. Very clean and cozy apartment, easy check-in, you can reach restaurants and lake by foot. Highly recommended! 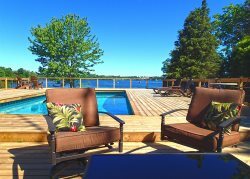 A comfortable and peaceful stay in the most perfect location in PEC! You are walking distance to a handful of the best bars and restaurants in the area (as well as a supermarket) and a short drive to anything else. The Flats West is a prime location that in the town of Wellington, PEC. The bedroom and large bathroom have been renovated very nicely, and it is conveniently located above the Enid Grace Cafe. We would book again. Beautiful room, in the heart of the village and close to many wineries! Spectacular place. Exactly as the photos display. Charming, clean, and well designed. This flat is conveniently located above a top rated coffee shop (with delicious smells wafting through the corridors), and just steps away from the trendy and hip restaurants and bars. Owner was pleasant and response to any inquiries were promptly answered. Also dealt with Galen initially who was very friendly and quick to respond. Will be back again for sure next time Im in PEC!! Thank you for the wonderful stay. Loved the bakery below the flat. Great to pop down in the morning for breakfast. Perfect location for touring the wineries. What a beautiful experience. Due to changes, required during our stay, Management was wonderful at accommodating our immediate needs and i was fortunate to rent both rooms. Both were spotless and beautfully designed. The central location allowed for a variety of things to do easily and I truly felt swept away, waking up to the smell of fresh baking and laughter coming from the space below. It was an experience I look forward to having again. Thank you. S.T. Our stay at The Flats was absolutely amazing. It is the most perfect little spot that is close to everything...no need to drive anywhere for dinner and /or a pint. It's also beautifully decorated with careful attention to detail - you never really feel bad for staying in a watching Netflix! Not only is The Flats lovely, it is also walking distance to just about everything. Not to mention that it's literally steps away from a cute cafe directly below us that serves up breakfast and lunch. My boyfriend and i actually woke up one morning to the captivating smells of their early morning baking (no complaints here, it definitely enticed us to go in : ) . One thing to note is if you plan on coming here during the winter, there are a couple of restaurants and shops closed for the season (call ahead!). Alternate times may be arranged outside of high season no earlier than 1 week prior to check-in. The Flats West is situated on Main Street in Wellington above the Enid Grace Cafe. This property includes 1 pass to the Provincial Park. Wellington Beach is within walking distance. North Beach 15 minutes north and Sandbanks 20-25 minutes South east. One block from Drake-Devonshire Inn and East & Main Bistro. Very close to many VQA Wineries.